Forget the NEG. The limitations of Australia’s ageing grid are threatening to hobble the rapid rollout of new wind and solar projects. It’s probably the biggest issue facing the renewable energy industry right now. Hurdles lined up on a track, fading focus. Further issues were raised in June, when new generation requirements and system strength guidelines were outlined, including some that were opposed by some in the renewable industry, concerned that they were being loaded with un-necessary costs. It has now come to a head, and last week, a briefing by AEMO head of operations Damien Sanford at a meeting hosted by the Clean Energy Council drew more than 100 renewable energy professionals, utility executives and financiers. They affect the projects themselves, could influence Victoria’s plans to reach 40 per cent renewables by 2025, and the choice of winners of its 650MW auction, and it could impact prices of large scale renewable certificates if the pipeline of projects does not go ahead as thought. There are varying views about the cause of the problems. Some accuse AEMO of over-reach and networks of being heavy-handed and inflexible, and in some cases of changing the rules mid stream. AEMO, however, insists that its proposals were well known years in advance and should have been well understood by all parties. Networks have a strong interest in getting to build new poles and wires and upgrading equipment, and some say that new renewable energy projects are being held out as a scapegoat for issues that have long lingered in the system. Others suggest some developers have failed to conduct proper due diligence, and should have known better than to force a project into a network area that clearly could not cope. Some even go so far as to raise questions about the skill-set of some developers. Some point to a combination of both, and more of one than the other according to location. They also point to the physical constraints of the grid, as well as archaic rules and the lack of visibility about the networks which means some project developers get taken by surprise discovering a rival project in the same area which impacts on their own operation. Whatever the fault, it all adds up to the fact that the limitations of the country’s ageing grid is catching up and threatening to slow down the rapid rollout of new projects. Grid upgrades and extensions are needed, but they could take years. And the issue is now coming home to roost for many projects that had planned, or had hoped, to begin construction this year. To many in the industry, this is a bigger issue than whether the National Energy Guarantee goes ahead, or is voted down at next week’s CoAG energy ministers meeting. Kane Thornton, the chief executive of the Clean Energy Council, says it’s a big issue. “We are nervous at the moment that pendulum is swinging pretty quickly here. It is a bigger deal than the having the NEG, or no NEG or some of the other issues,” Thornton tells RenewEconomy in this week’s Energy Insiders Podcast. Christian Schaefer, head of Systems Capability at AEMO, told Reneweconomy on Friday that AEMO it has been warning of the issue, particularly in Victoria, for several years, and was working hard to resolve the issue with developers. “There is no intention or interest from AEMO to hold anyone up from connecting to the power system,” Schaefer said. But the fact was, he said, that some areas had reached their limit. Part of the problem was that the speed in which solar farms can be permitted and constructed (6-9 months) had caught up with the system’s ability to upgrade infrastructure (5- 7 years, depending on environment impact and community opposition). Much of this would be solved, Shaefer said, through the Integrated System Plan, the AEMO blueprint for how the grid should evolve to one dominated by renewables over the next 10-20 years. But this requires investments that could take years. Some projects want to be built now. Schaefer confirmed that some project developers had been advised they could remediate shortfalls via “traditional means” such as synchronous condesors, or they could wait for network upgrades. RenewEconomy has been told that a synchronous condenser could add $8-$10 million in costs to projects already tight on margins. A group of solar farms in north-west Victoria have been told, RenewEconomy understands, that their additional costs could total $60 million. If RenewEconomy is sounding vague about the identity of the projects affected, it’s because of the sensitivity of the issue. Developers, contractors and clients affected are choosing to speak “off the record”, partly so as not to put grid owners and market operators offside. And in many instances the details are “commercial in confidence” and subject to financing and legal constraints. Schaefer also declined to talk about individual projects, but noted that the main area in Victoria where the problem is emerging is restricted by the current 220kV line, looped from Bendigo, to Ballarat, to Horsham and Red Cliffs, which was originally designed to deliver electricity to regional load centres not to connect significant amount of bulk power generation. 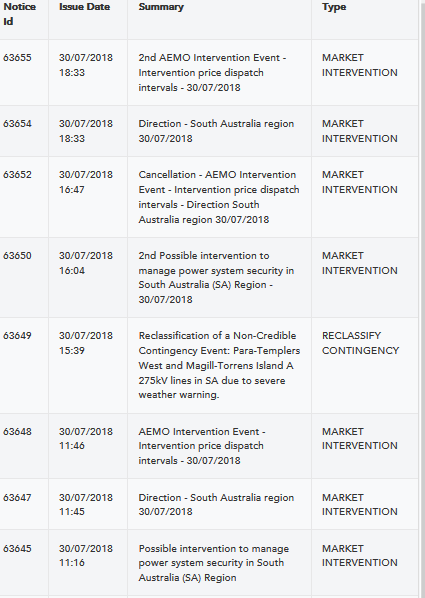 In the documents we wrote about in May, AEMO noted that three major wind farms had already been built on this loop, while three more wind farms – Murra Warra, Bulgana and Crowlands – and at least four solar farms, the 110MW Wemen, the 100MW Bannerton, the 90MW Karadoc, and the 81MW Yatpool solar projects, are planned. But there are others also in the pipeline. It is not clear which of the projects mentioned above or in the pipeline are having to go back to the drawing board. Neoen Australia, which on Friday announced it had reached financial close for the Numurkah solar farm in Shepparton, which will be the biggest in the state to date, says this project is located outside of the worst affected area. We asked if there were issues with Bulgana, but it said the project, which will sit alongside a Tesla battery, has also chosen advanced communication software which should limit any impacts. CEO Franck Woitiez declined to comment further. Wind and solar developers in Australia have had to deal with a range of new hurdles in the past 6 to 12 months, as new generator rules were designed, and in some instances came into force before ratifitication. This refers to the ability to ride through disturbances at a certain level and has required some projects to either dial down their rated capacity, or install more inverter capacity. Both come at a cost. There are also more onerous commissioning procedures – with reports due when a project reaches 25 per cent, 50 per cent, 80 per cent and full output. This can be a slow process and explains why so many newly connected solar projects are not yet operating at full capacity. New projects are also being required to produce sophisticated (and expensive) modelling from a program called PSCAD that analyses the impact on the grid. In some instances, the requests have been made “retrospectively”, in areas where data is not readily available, and developers of small projects, even less than 1MW, complain they too have been asked by network operators to deliver the same data. Some projects have also been hit by changes to marginal loss factors, an algorithm that dictates how much output is credited to a generation plant, given the network constraints in the area, and the number of other generation plants and customers on a particular line. “The amount of engineering required going forward is quite immense, and this in a market already struggling with engineering resources,” says one developer, on condition of anonymity. One of the issues is who gets to pay – the generators already on the grid, the new generators connecting, or everyone as part of regulated network costs. Thornton says that the fact that the market oprator is paying much more attention to how new technologies are being connected to the system is overdue and welcome. “We do need to be careful,” Thornton says. “Some of the issues and challenges in the system – like frequrency and voltage control – they are not new issues . One of the concerns has been the recommended use of synchronous condensers, a technology that has been around since the 1950s, but whose real benefit is questioned by some. Schaefer says AEMO is willing to adapt, and points to the engineering efforts that have allowed the first wind farms in the worst affected Victoria region to be connected in recent years. And he says it says it is open to new ideas. “What we encourage people to do is that if they have got solutions we would love to hear from them,” Schaefer said, and these could be added to options considered for the regulatory investment tests (RITs) if they provide additional benefits to the market. Last weeks article on the Stockyard Hill Windfarm (530MW) south of Beaufort which is close to the saturated 220kV line between Ararat and Ballarat. Hence there is the requirement of 70km 132kV transmission line connecting to the southerly 500kV transmission line. Lack of capacity and system strength in REZ’s is not a new issue it’s been mentioned in various state transmission reports previously, it’s now been highlighted by the ISP which will begin planning the transmission development required. Again SA is at the forefront of the transition with the installation of condensers in the network, the Riverlink interconnector proposal includes condensers at Buronga and Darlington Point. And until something else can deliver fault current and inertia like a synchronous condenser get used to more of this ‘old’ tech being installed Giles. So, synthetic inertia isn’t the total answer? Batteries or wind turbines. We are still going to need spinning metal? Simple answer is no. Power conversion systems (inverters) can be designed and programmed to perform pretty much any function required. Archaic regulations are preventing full utilisation, to the point where the full potential of inverter technology isn’t even being fully explored nevermind implemented. Modernising the regulations, not invest in more obsolete hardware. Thanks for putting me at ease. A depressing thought having to keep spinning metal far into the future. It’s nice to have a little bit of spinning metal to smooth out some of the digital artifacts of digitally generated waveforms, but even (for example) the extraordinarily peaky systems for electrified railways generally get by with one for the entire system. DJR I don’t think it’s quite as black and white as that: as long as you still have most of the energy most of the time flowing from large centrally dispatched power stations, the protection co-ordination is going to be set up with DER set to limit fault currents and ride thru faults while tripping on significant frequency perturbations, while the big gensets supply inertia to limit RoCoF and fault currents. I don’t think we are anywhere near being able to reprogram all the DER to act one way when they are at high levels of penetration while another way when they are not. It would be interesting to see if you could gradually redesign the network to be otherwise, even if that was a progressive thing. You’re right, it couldn’t be done with the current fundamental operating strategy. It will require a complete break from that, a whole different operating strategy. The required technology components and concepts are all out there, just not put together to make it work. So I agree, it won’t happen anytime soon. But it can be done. Originally I thought that inverters would be able to do the job but a bit of research I’ve come to the conclusion that the future grid will be a combination of various technologies (even if they are ‘old’ school). Rotating machines will be needed to provide things like fault currents (we’re talking in the kA’s) which protection devices need to operate when detecting faults, voltage control is also extremely important. In the future super capacitors may play a part. The SA system strength project will see 6 condensers installed (of about 600MVA in total) for about $100m, it’s currently estimated that running gas during intervention costs about $40m pa. It’s a much cheaper option as coal/gas disappears out of the market until new sources of inertia come from solar thermal, geothermal and pumped hydro. There may also be a decision in the future to market inertia to encourage generators to operate as condensers when not generating. I understand that there are electronic inertia simulators available for wind generators. Are or could they be built for a several few hundred Mwatts ? If a synchronous condenser costs $8-10 million, it would make no sense as a balancer or storage system. You would be better off with a few Powerpacks and a millisecond inverter, which does both. I thought we had sorted this out. Dinosaurs. The idea was to reuse old gas turbines to do it I think, less cost. A very viable re-cycling solution is to convert retired generator rotors into synchronous condensers. In most cases the set can provide even higher reactive power compensation than it would if in generation service as the excitation power can be increased significantly while not governed by MWe output but rather MVar output whether lagging or leading. Engineering is required, some static starter electronics can avoid the need for motor starting complexities and it will need some customised control gear too. The capital cost of the large rotary machine is avoided and it is going to likely be connected into the correct part of the transmission network, thereby lowering augmentation costs. The functionality of static Var control kit cannot be compared to the superfluous rotary synch cons. They are not in the same ballpark. Remember also that SCs do not add MW to the network as do batteries (or “Powerpacks” as you call them), they merely balance the Vars by way of reactive power compensation. A piddling 20 Kw Solar system has been restrained for export at 3.2 kw per Phase. This is at the micro level the kind of rules as for large size. It has a plan to develop a pretty significant Wind Farm plus Solar stage 1 and 2. I think they have potential to use PHES as well. If my memory serves me well the size of the Wind Farm is something like 900 MW and the 2 Solar systems are slated to be both 200 MW each. Please define “major transmission line” in the context of your discussion point. Once upon a time, a double-strung 220kV link running for 300 or so kms and built back in the 1950s, was considered a major line but in the context of today’s network, is just a secondary network. 500kV double strung networks are major lines capable of shifting large amounts of power. Well why can’t I install a 35Kw system on my home / business? ‘cuz the utilties are afraid of you. I am sure you could do that if you either islanded yourself (home / business) from the grid (or limited your grid output to the maximum allowable rating permitted by your Distributor) and stored the energy you produce. I assume that you have looked at your average daily consumption across the seasons, your peak consumption and quiescent consumption when you determined that you required a 35kW system. Of course if your running computers, electric motors or fluorescent lights (to name a few), your power factor will likely be anything but unity. You may require 35kW of “real power” but due to inductive or capacitative loads, your system may need to support 40+kVA. Also what’s your starting current requirements? So if you want to output 35kW to the grid (i.e. when you’re at full generation and no load), you will need to comply with the Distributor’s Requirements. After all you don’t your system to introduce instability into the local grid potentially disrupting the neighbourhood’s enjoyment of electricity supply. Moreover many distributors now limit current on a single-phase home connection to 40A (that’s 9-10kW at unity Power Factor). This is for phase balance reasons. For those home owners who want to consume more, they are usually required to install a three-phase lead-in. So your system will likely need to be three-phase in reality. Synchronous condensers are being installed worldwide to combat the issues brought into grids by reduced inertia. Add these to the list of extra investment in transmission required by the “not so cheap” renewables…! And if they wanted to build a traditional power plant in the same location they would have to build the same things as well. And it was built by taxpayers by the SEC in Victoria. Not necessarily, they can use the alternators in the station. That station ! They could use its alternators. That is what is normally done. When one machine even in another power station starts to have trouble keeping on frequency they increase the excitation current in another one and that helps push the lagging one along and stops it dropping out of lock with the rest of the network. are generators. They dont have to install syncons if they use the generators that are ceasing fossil fuel energy generation. It was a matter of more concern a few years ago and the problem being the rate of change of frequency which increases each time we remove a fossil turbine from the grid. Today it is not the same problem as the new technology options dont need the same inertia and slow rate of change. We will have milli second localised response options. This will eliminate the power swings during disturbance. The power swings are the main cause of exponential voltage colapse. Voltage colapse is the most likely cause of total black and is directly proportional to the square of current of power swings. Many of the security and stability problems of a large base load grid disappear when load side management and load shifting takes a seat in the new market. Can’t come quick enough for SA. Curtailment still at 1296MW, interconnector well below maximum and diesel coming on to satisfy system strength requirements. Lots of wind but spot above $150. Frustrating. Unfortunately I can’t scroll down to see any notices but there were some spikes! Hi CoomaDoug, I’be read about good improvements in some of the inverter technology, but I’m not sure any of the power electronics can adequate sustain fault current or reactive power. If a fault won’t clear, the voltage will sag and the frequency will go down with it. Then it’s nighty night, and I don’t think an inverter can restart a black grid. Synchronous condensers are a net load, therefore constitute a continuous overhead cost in power (it’s effectively a motor and draws amps, plus auxiliaries like excitation and cooling) and maintenance. All things to consider as rooftop PV accelerates the afternoon ramp rate into the duck curve, and wind ramping also causes large power swings. You understand how local backup is utilised to guard against failure of fault clearance? If we have a fault on a line close to the power source, the voltage drops to nothing. The fault is cleared instantaneously. If the circuit breakers fail, after an allotted time the connected circuits to the fault are all disconnected. If the fault is located near the end or beyond the end of the line the fault clears after a time delay enabling the fault to be cleared within a closer zone. The voltage is affected due to the excessive consumption of reactive power. There was a time when air conditioners used a lot of inductive load. The modern ones dont. Back in the 80s in Canberra in a heat wave the aircons consumed a lot of vars and this causes the voltage to fall. We had a lot of voltage problems in areas like that back then. Syn cons in Snowy were vital. Later years transgrid built capacitor banks to generate vars for voltage support. In the future there will be changes on the load side just like the change in air con design, that will very much change the way it all goes. As for the running cost of syn cons, a hydro machine of 300mw can function as a syn con consuming roughly 2mws and importing 200 mvars in high voltage low load times or exporting 100mvar in low voltage high load periods. So you can assume zero cost in the high load times because the unit would use that energy as a generator in any case. You are right, new buildings have very little inductive load. Large motors for pumps, fans and compressors are controlled by variable speed drives, so have no inductive load. Old style fluorescent lighting had high inductive load, but the new ones have electronic ballasts and no inductive load. Also LED lighting is the now the dominant lighting technology for new buildings and it has no inductive load. As old equipment on the system is gradually replaced there will be less and less inductive load. Every inductive amp you remove from the load leaves a window for more MWs and cost is nothing. The products are leaving the old copper coils in history. Hi CoomaDoug, yes I agree that hydro offers important services to grid stability, unfortunately we are one of the driest countries around so hydro is tough to maintain in many locations. A synchronous condenser is quite a different beast to a capacitor bank. The latter can only correct lagging power factor by supplying leading VArs and they have to be switched in discrete amounts. Synchronous condensers can provide both leading and lagging correction in continuous amounts. So you’ll generally use PFC for inductive loads like air-con motors and at industrial sites. I’m not sure a windfarm or grid solar generator connection agreement and the associated performance standards will allow for the inflexibility and discrete step changes of capacitor banks. Ah the driest continent furphy…pumped hydro can be a net retainer of water, and provides all the advantages of a synch con or hydro. Ben what do you mean exactly by fault current. If a capacitor bank or synthetic inertia or batteries or flywheels are behind an inverter and 550 MW disappears from the system can’t all of these resources respond just as fast as a syncon. If you have a 100 MW battery/asynchronous flywheel/capacitor bank it can ramp up to full power in 140 ms. lets say you add 5 cycles, for detect and measurement time and so over 200 ms the battery system is at full power, supplying an average 95 MW for the two seconds or 430 Amps. Depending on the technology that supply can continue for minutes to hours and if generation is still weak the storage resource goes offline. It does not slow recovery by immediately becoming a load on the system like a syncon does. If power on the system is coming from gas turbines and the frequency drops to 49 Hz then the turbine output initially drops also by (49/50)^2. so the system risks becoming a cascading failure. For example if the SA system was running 1000 MW of GTs which have an inertia constant of 3 at 800 MW output then their inertia would contribute 120 MWs but over 5 seconds or so before governor response starts to make a meaningful contribution the generators lose 150 MWs. So the gas turbines initially are no help so all the load falls on the syncons. Over a more normal 20 -50 second recovery time from a large frequency excursion, 100 MW of batteries/flywheels capacitors could supply 2,000 to 5,000 MWs whereas a 500 MW syncon only supplies the above 180 MWs. Hi Peter F, regarding fault current, simply, if a transmission line shorts you need to clear the fault. That actually means opening circuit breakers to de-energise the faulted line and stop current going where it shouldn’t. Protection relays measure the amps and volts and make decisions on whether or not to trip the breakers. To discriminate between transients, genuine loads and genuine faults, the thresholds for faults are high. A weak system cannot supply enough current into a short circuit to reach the trip threshold. So it doesn’t trip as fast as it should, or doesn’t trip at all. A simple example is a typical SWER line which may not trip even if it is lying on the ground due to the high impedances and low fault current. Your analysis of inertia applies to frequency response, and is related to rotational speed of mechanical systems, not fault current. Inertia helps during power unbalance – frequency is directly related to the balance of power generated and consumed. Hence why we’ll benefit from dispatchable inertia sources for a long time to come. Hi Peter F, I think a full and detailed discussion about traditional rotating inertia vs power electronic inertia will find pros and cons in each. There are fundamental links between frequency and active power, voltage and reactive power which both technologies need to manage. e.g. I know that interconnected rotating synchronised generators are prone to low frequency intra-regional oscillatory instability that needs very particular measurement and controls to manage – these are described as Power System Stabilisers (PSS). This is usually included as part of the excitation control system on turbo-generators. A typical wind farm consists of several doubly fed induction generators (DFIG) connected to the grid via an asynchronous inverter and step up transformer. There are no excitation controls necessary on a DFIG, and no intra-regional oscillatory behaviour between asynchronous generators. I only go to that detail as an example of the many layers a full analysis would require. I’m sure there are plenty of textbooks and white papers about it. If you use the following google search there are plenty of useful papers out there that delve into the rabbit hole! Thanks Peter, I hope my few insights are helpful. I’m here to learn too! Thanks again Ben for unhelpful inaccurate sarcastic content. Remember that back in the day ALL the transmission for remote coal fired power stations was built by tax payers and paid for by consumers. The current challenges will be overcome when pumped hydros are up in running at appropriate points in the network, or when generation is located appropriately (as in REZ). Hi Ben, I think the problem you refer to, that is, other costs that ought to be considered, is a common problem of generators, not renewable generators. When capturing the cost of a coal fired power station, how much cost to the community is overlooked? Do we include the cost to health? Do we include in the cost of coal the proper cost of rehabilitation? Ask the mines department in any state about the hundreds (maybe thousands) of mines that are being rehabilitated (or not) at public expense. Do we include the cost of water? I’ll give you a water example, the Fish River Water Scheme which is a water supply scheme in the Central Highlands of NSW based around Oberon Dam. My point is that the cost of thermal power stations is carried broadly by community spending on other critical infrastructure and later mop up costs and these costs are accounted for separately, and not directly attributed to the generator. If we are to account for the total costs of a particular generator, we need to consider all its impacts on the community. We didn’t even get to the big one yet. You know, the elephant in the room. Hi Chris, you raise a good point, which is basically that any generator needs transmission infrastructure. I’m not disputing that, I’m only making the point that grid scale wind and solar now require additional investment in transmission and firming that isn’t often mentioned when discussing renewables. With regard to your other points about historical costs of coal power stations – yes of course this was nearly all built by government investment. But I think it would all be paid off now and made its intended ROI – would that not be a net benefit? When you mention cost to community, I assume you mean health impacts – but there is also benefit to communities in employment providing improved living standards, local investment etc. Again – no net benefit? As for rehab, I guess that’s a cost borne by taxpayers eventually in some cases, but I’m not sure what the actual cost would come out to, I know an engineer in the QLD government department devoted to it that has just recently moved into 1 William – I might ask him about it. Do coal power stations pay coal royalties? I guess by paying coal royalties you are suggesting that coal power stations are contributing to their health costs and rehab cost etc by way of royalties. To me royalties should represent a payment to us, the community, for exploiting resources that we own. Norway has charged the oil companies substantial royalties for their oil, and now has the worlds largest sovereign wealth fund. We have pretty much pissed away our wealth that could have come from the mining boom. But anyway, back to coal, not I don’t think royalties should be there to balance the downside. The cost to community health and the environment should be charged against coal as a separate charge to royalties. Other miners pay royalties, such as iron ore miners, but don’t impose the same costs on the community that coal does. I believe royalties are paid on sale by the seller not the buyer. Only if a tied mine is a miner and generating company however, the mining entity is the liable entity. This is my observation only. You mean to say our gold-plated grid which has trebled in costs to consumers in the past 10 years cannot cope with the future??? To be clear: Was the demand actually increasing, or was that a modelling prediction? My understanding is that starting in 2009-ish, demand began to turn, then fall; a move that had no historical precedent. I worked for ETSA for 14 years through the 90s. I vividly recall a projected demand graph around 1995 with growth at a 45 degree angle. Demand did increase enough pre 2000 to cause issues with distribution assets like transformers during prolonged hot spells. ETSA did a lot of “gold plating” replacing or retrofitting transformers and other infrastructure to cope with heatwaves. To meet these SLA’s they built redundancy in the distribution network and ramped up vegetation control. I think a combination of price rises, energy efficiency and rooftop PV after 2008 have affected demand. Also SA has lost a lot of manufacturing. Last anectode. When I left (Electranet) I used to have drinkies with the wizz kids. I was a very very early adopter of grid connect PV and said something like, “you should be worried about rooftop solar” Needless to say, they laughed. So yes, rooftop solar and energy efficiency have totally blindsided the incumbents. Is a national strategic DC transmission system required? Your term ‘national strategic’ captures the dual imperatives for its design and function. It must not be confined to the eastern seaboard and must not be limited by a focus on just meeting the demands of major east coast conurbations. and accessing many good sites for pumped hydro storages. the design should consider some ‘international’ perspectives – such as how Australia can establish and benefit from renewable energy supply and demand relationships with neighboring countries. This is not a new problem. Voltage control is the most important security issue in the transition. Over 10 years ago we had agreement across the industry that fossil fuel gens shutting down ant out of the grid could be used as Syncons. Unfortunately it is zero market certainty that let that one disappear. There are rapid new technolgy options that can solve the problem and will. However in the transition there will be a need for var generation and consumption just as there always has been. Modern load side technology and load shifting will make the solutions a lot cheaper and the logic of this can be rather complex. It is proposed that 1000 MW of Snowy 2 generation will be non-synchronous, using variable-speed turbines and inverters. Do you think these will cause problems of voltage and frequency control? There are enough sync turbines to do the job. The biggest problem is excessive var generation when load is low. But the pumping function in the load shifting process will greatly reduce this problem. I think Alexander it’s because most inverters are set up for no pf control or var supply, and with tight limits on trip voltage. So unless they sign up to allow the network to control them to maximum advantage, most won’t bother. But NSPs are also insisting on RoCoF capability as well which the owners of large solar farms don’t seem able to meet without mass inertia of some sort. I’m not sure whether this is a cost decision or what is the basis of it. The other issue not often discussed but I’m sure that plays large in NSP’s minds is protection co-ordination. Unless the solar inverters are able to receive instructions from AEMO then the protection settings appropriate during the day while the solar is supplying most likely well in excess of night time or local loads, are probably not appropriate at night. Increasingly not, with hub substations, or significant embedded generation on industrial buildings. I don’t get how inverters can be a problem, inverters can do all a sync turbine can do and respond quicker. Is this an instance where the expertise in the power generation sector is lacking or am I missing something ? Austrailia has traditionally been mostly baseload, without grid stability issues. Did we not have years of gold-plating? … right. That was on the distribution network mainly (fortifying for peak demand load of all those new AC units in the last 15 years) not transmissions network. It looks like we will have another round of gold plating for transmission but historically transmission costs to the consumer have been much lower than distribution costs. However, no matter what the level of cost is: the price for the consumer will increase! This split of the costs by AEMC gives an idea of Distribution and Transmission costs. That’s your opinion, ISP shows we need to find the balance between better interconnection between the states or building more local storage and gas generation to firm up renewables. Not sure what is wrong with what I said in principle; as “in principle” anything either player is doing to ‘improve’ things will as a fact, increase the cost for the consumer; irrespective, whether I agree with what you said (which I do) or not. South Australian domestic power prices are already at parity with solar/battery power. Once that point is reached the price is capped because consumers desert the grid and the State government is left holding the tab for any new “goodies”. The latest additions were paid for from general revenue. On the other hand, the 30MW/120MWh portion of the Hornsdale Power Reserve that is used for load levelling has potential to provide an economic return through daily price arbitrage; demonstrating that sometimes spending money can save more money. It relies on the battery getting at least 10 year life. The economics of any intermittent ambient generator are pathetic. The latest wind auction price of $50/MWh in Victoria is offset by saving $3/MWh for unburnt brown coal. So spend $50 to save $3. However it gets worse than that because eventually the coal burner needs to be replaced with gas because coal lacks the turn down and fast start needed to support ambient generation. The cost of gas generation is $120MWh and there is 2MWh of gas required for every MWh of wind making the real wholesale cost of the wind $123/MWh, including the LGC cost. Just 10 years ago the wholesale price was $35/MWh. I have read this post a number of times and I am still convinced you are barking up the wrong tree. You quote a number of issues where your thinking is skewed towards one particular technology over another. How about saying, when supply from wind, solar or some other technology is insufficient to supply the absolute need of the grid then some form of dispatchable power will be required. Yes, FF generators will be shutdown but that does not imply automatically they will be replaced with gas fired generators and certainly not 1 for 1. There are numerous demand side solutions (some not even thought of) for the future. Just look at the three day NEM graph to see your statement of requiring 2MWh of gas for 1MWh of wind is completely inaccurate. Because of that inaccuracy, your $123/MWh figure is totally meaningless. Leaving brown/black coal or gas unburnt should be your aim. Finding the most cost effective way of achieving this is where you should spend your time. I want my grandchildren’s grandchildren to be able to have somewhere to live, don’t you? If a wind farm in Victoria sends out 1MWh of energy, what is the impact on the rest of the grid? Quite simply it means reducing the amount of brown coal burnt by about 500kg. I estimate a fuel saving of $3. So the power has been sold at $50 to save $3. It has also earnt an $80 LGC that a retailer can buy, surrender and pass on the cost to the consumer. As time goes by and more wind generation is added, the load on the coal generators becomes more variable and they no longer have the turn-down and ramping capacity to follow the load so they become uneconomic and shut down as we saw with Hazelwood. However that dispatchable generation has to be replaced with fast response dispatchable generation. Hydro is quite limited in Australia and is storage bound in any case so inevitably gas becomes the buffer for wind and solar. We have seen that in South Australia since Hazelwood shut down although SA uses Victoria as a battery with a rated capacity of 600MW and unlimited storage capacity. The wind only works for 30% of the time on average so the other 70% eventually comes from gas. The cost of gas generation is say $120/MWh. The cost of wind plus its LGC is $130/MWh. So the average cost of each MWh from wind is $130 x 0.3 + $120 x 0.7 = $123. Each region has a similar pattern as the total with some small degree of time shift. Thank you for your reply. Lets start with your statement about fuel prices. Wind and solar hav a zero fuel price. Please adjust all your posts so it reflects this and we will get to the bottom of your other errors. AEMO is half owned by the utilities and the other half by the governments of state and federally. A bit silly to say govt can’t get anything right. Who put man on the moon? Ignorance and greed. Smells a lot like NBN with no government responsibility taken? Synchronous condesors provide power factor correction via capacitors, solar inverters can also provide power factor correction and frequency regulation so I can’t see how this is required for solar plants. Wind turbines vary but this could be an issue for some. Ride through is another question where I don’t know that bigger inverters would necessarily help, perhaps bigger capacitors for short periods in the magnitude of seconds and batteries if longer is required the unanswered question is what time period is required. As far as the Tesla battery this I would of thought would be ideal for grid support under any circumstances if there are regulations getting in the way I suspect the regulations may be getting in the way of providing better grid support. Neville, a synchronous condenser isn’t capacitors, it’s a specially controlled motor used to manipulate reactive power in an electrical system. Reactive power is an interesting subject, plenty in it. FWIW, DC doesn’t have reactive power. It’s a result of using AC. When running as a generator we can adjust the exitation of the rotor. We increase the exitation current of the rotor and the gen output voltage rises exporting vars onto the grid. We decrease the exitation current and the unit imports vars. We can run purely as a syncon. This means closing off the turbine and draining the water. In the syn con mode we can vary the voltage 3 times as much. work the opposite to inductors and only increase voltage. Inductors are just like a big coil that will consume vars and lower voltage. The best way to get a fully renewable grid is to do it in the cheapest possible way for the whole system. Building more wind farms in Western Victoria and solar farms in the Northwest and then adding billions in transmission and storage is not the best, cheapest or more reliable way to do the job. I am sure AEMO is not perfect, but building a $200 m windfarm in Gippsland instead of a $180 m windfarm in Western Victoria, with no new transmission needed for the Gippsland plant and out of phase with western Victoria so reducing storage requirements will produce cheaper power overall, the cheaper it is the faster the transition will happen. The house near me is putting north, east and west facing solar panels up. It might be 10-12 kW worth of panels and only a 6 kW inverter and only 11-12% CF on the 10 kW but it reduces morning and afternoon grid demand and/or the size of the battery needed for a lot less cost than bringing power from a windfarm in Western Victoria. NREL says California can get 73% of its energy from 16% efficient solar cells on about 20% of its roofs. If we use 20% efficient solar cells (not quite there yet I know) on 30% of our roofs (see above) we already have enough wind, hydro and solar farms and transmission because grid based renewables either on line or under contract will supply 30% of our electricity. Peter F, this is really interesting. Could you please email me your contact details. My email is [email protected]. Thank you. I believe these projected losses are much higher than NREL projects for suboptimal orientation, in California. Funny thing about about the SECV network being thin at Mildura and Horsham. It could have been worse…. In reading the archived reports of the SECV, network development was high on their agenda. Victoria was very lucky in that the SECV opted for 220kV over a much smaller 165kV for its early-ish transmission planning (yes, it initially ran a 132kV (sub) transmission system from Latrobe Valley to Richmond and around to Yarraville) and lucky again when the SECV opted to go with 500kV runs in 1970 for its mainline transmission systems (over 330kV). In doing this it enabled the SECV to extend the mainline network to Portland (for Alcoa) which in turn enabled the build of the SA interconnector at Heywood. I suppose this was gold-plating in some eyes but the robust SEC (and Gas) network was a great foundation for stimulating the development of Victoria’s manufacturing sector. But like its interstate counterparts, the Victorian network is thinnest at its furthest reaches. The 220kV rings / loops which intermesh in Ballarat and Bendigo were only ever designed to transport power to the relatively small but long distance loads of Horsham, Mildura and Broken Hill (And that’s why Broken Hill is on a 220kV line as it was an extension of the Victorian network). And unsurprisingly, the thickest parts in the Victorian network were the multiple mainline 500kV runs from the Latrobe Valley, through to South Morang and Sydenham in the Melbourne metro area. Similar scenarios apply to the other state jurisdictions. Perhaps if our beloved State Governments hadn’t sold off the public transmission network, perhaps they would be in better shape now and probably would have been augmented in a timely manner and possibly in accordance with State Government policy thrusts such as State sponsored development of renewable zones and industry. But we’ll never know now and we’re left to lament what might have been. And to the point about developers needing to revisit the funding and business cases, I fail to see why many of these developers could not have foreseen difficulty in connecting when a simple examination of the APRs of the respective TNSP, would have spelled it out quite clearly. Perhaps that these groups hadn’t engaged the correct specialist engineering consultants or were just hoping that some one would come along and pay for necessary network upgrade, to allow their project to connect. A simple analogy is to try to pump a high flow of water through a very long 12mm standard garden hose (say 1 – 2 km long). You’re not going to get a lot of flow, the pump has to work hard and the hose construction at the pump end has to be strong enough to take the applied pressure, without bursting. It has also resold before being even being built after being approved by the State planning Minister. I hope it’s not going to be like many toll road and other projects where it’s all about the upfront deal and not outcomes. Or Even worse it never gets off the ground due Grid Connect costs. Sounds like a lot of wind and solar farms will be phoning up Tesla to get some batteries. The TL:DR summary is that wind and solar electricity come with a vast array of hidden costs if you want them to work on a reliable electricity grid. Trying to power a grid with wind and solar is not cheap. Even if the wind turbines and solar panels were free, the additional costs, which are constantly ignored or pushed onto others by the “renewables” industry, would still make “renewables” vastly more expensive than other generation methods. What I see in this article, is the Australian grid manager behaving rationally, and the wind projects complaining that they might actually have to pay the full costs of bringing their product to market. After 20 years of all-out effort and hundreds of billions of Euros squandered, Germany still emits more than 480 grams of CO2 per KWHr of electricity generated. And Germany has the 2nd highest consumer electricity prices in Europe. Denmark, with more wind power, has the highest electricity prices in Europe. France emits less than 60 grams of CO2 per KWHr generated. France has the 7th lowest electricity prices in Europe. France’s electricity prices are 1/2 those of Germany and France emits 1/8 as much CO2. Why are you trying to imitate the abject failure of Germany? In just 16 years, from 1976 to 1992, France successfully decarbonized its electricity generation. France is not a fluke. Ontario emits less than 80 grams of CO2 per KWHr. If you sincerely care about reducing CO2 emissions, it’s time to admit that adding wind to the grid does nothing to reduce CO2 emissions. You’d be better off just switching directly from coal to gas generation, rather than trying to fill in with wind. Wind energy is just an expensive way to burn more gas. It does no more to reduce CO2 emissions than just switching from coal to gas does, because you burn so much gas compensating for wind’s intermittent nature. Building wind mills is not synonymous with reducing CO2 emissions. This isn’t a philosophical argument. This isn’t a mathematical model. Germany’s CO2 emissions with lots of wind are huge. France’s CO2 emissions with lots of nuclear are small. In the rest of the real world, no region has decarbonized a reliable electricity grid with wind/solar. In the real world, the only regions with low CO2 emissions are either lucky in terms of hydro power or have built nuclear. It’s time for Australia to go nuclear. That is, if you actually care about pollution and CO2 emissions, and poor consumers ability to afford electricity. If you’re a shill for the gas companies, then keep right on advocating the abject failure that wind energy is in the real world. You were right about the TL:DR. But you could have summarised by saying you are not prepared to add renewables on the same basis that taxpayers supported the development of the grid for coal and gas ie by paying for the delivery infrastructure up front and adding the ongoing costs to customer bills. Or the costs carried by taxpayers around the world for nuclear subsidisation. You could have stopped there and saved the rest of us the bother. You are incorrect. The situations are not comparable. Other, dispatchable forms of electricity generation can be built closer to their end users. So called renewables add costs vastly disproportionate to the cost of generation. For a conventional plant, the cost of transmission is a small fraction of the plant cost. For “renewables” the cost of transmission is often more than the cost of the generation infrastructure. And all that theoretical cost discussion aside, the fact remains that no region has decarbonized by building renewables. In the real world, renewables are a complete failure at actually reducing CO2 emissions. That was all the bother you want to be saved from. So what you’re saying is you don’t actually care about CO2 emissions. All you care about is building more wind mills. Wind mills do not reduce CO2 emissions in the real world. That’s the inconvenient truth. I think you will find that rooftop PV can be built very close to the end users. And you may also find that Sth Australia has reduced its electricity emission intensity by about a third between 2011 to 2017 thanks to installing lots of wind generation. I think that I will find that the reduction is no more than would have happened simply by switching directly from coal to gas, because, as I mentioned above, that’s all installing wind really does. Wind is so intermittent that it must be backed up by gas, which can switch output quickly — something coal does not do well. Switching to gas is all well and good because it reduces emissions, but it is still a fossil fuel and it still emits too much CO2. Also, while gas prices are relatively low at the moment, the gas industry is doing everything it can to grab market share. The price will be going up. 85% of the cost of electricity generation from gas is fuel cost, so when gas doubles in price, the electricity from gas goes up by 85%. You are correct that roof-top solar’s hidden costs are not in transmission lines. It has other insidious costs that people push onto others. Roof top solar is nearly useless from a grid point of view. It is a way for wealthier individuals to shove their costs off onto less well to do grid users. The sun doesn’t shine at night. One still needs all the infrastructure and generating capacity one needed without solar. Fixed panels achieve peak generation several hours earlier in the day than peak demand. They are not a useful way of load balancing and add instability to the grid. Of course, on could add batteries, but that is horrendously expensive when you actually look at the life cycle requirements. Further, there’s no decommissioning plan in place for solar panels. When they wear out in less than 30 years, they will be a toxic waste problem. A diffuse one which is spread all over the landscape, laying on people’s land or back yards and not concentrated in one place where if could be more easily managed. You cannot power modern industry with roof top solar panels. There is simply not enough reliable power available to run industry. As a curio that reduces a residential energy bill while pushing grid costs off onto other users, it works great. As a solution to a modern reliable grid that supplies an industrial society, it is a pipe dream. Finally, this may sound prosaic, but roof top solar kills a lot of people from falls. Not as many as gas and coal kill with unrestrained pollution through lung disease (or just gas lines blowing up, which the news ignores) but far more than nuclear has ever killed. I’m in my mid 50s. I don’t want to take up roof top solar as a hobby. And if I had to pay someone else a monthly fee to clean my panels, it would eat up all the energy savings. Again quite wrong: if you look at the locations of our PS they are built close to fuel or water for cooling. 7GW of our current power supply is on consumer’s roofs – can get closer than that – and rooftop solar is anticipated to supply half our energy in a few decades time. No-one will build a nuclear power station near a city and their large cooling demands means they will end up remote, high cost white elephants. Meanwhile, as we saw a few days ago, 30% of the energy on the NEM was being supplied by RE – real world, not nuke fantasy. Interesting that you use the word fantasy. It is not true that no one will build a nuclear power station near cities. Nuclear power is safer than all other energy generation sources, including wind and solar. Strangely, people die when they fall from high place. And people fall from high places when they climb wind towers and solar equipped roofs. The negative view of nuclear has been created by a steady beat of propaganda paid for by fossil fuel interests and largely funneled through “charitable” foundations and then into organizations like Green Peace. That negative view can more easily be reversed than it was created, because the scientific facts and the experience in the real world is on the side of nuclear being the best kind of power plant to build near a city. Do you actually care about CO2 emissions? Do you care about the consumers’ ability to afford electricity? I’ve already pointed out that in the real world no-one and that means not one single place that you can point to, has made substantial CO2 emissions with wind and/or solar. Zero, nada, zip. Despite what I would call total political dedication in the cases of places like Germany and Spain, their renewable programs are total failures when you actually measure the CO2 emitted before and after. Why do you think that your result will magically be different? It is utterly irrelevant if “renewables” manage to hit 30% occasionally. They cannot do that reliably and that is a requirement for a grid. Reliability. The only measure that means anything is annual energy contribution. Hitting a large number for a few hours is a stunt, not a measure of reliable power delivery. Building wind mills is not the goal, is it? You mention 7 GW of supply. GW is a measure of power available, not energy delivered. 0 GW of that solar supply is available at night and, in fact, during most of the hours of the day. You can not power a reliable grid with solar power. Do you want to bet the world’s climate on magical battery technology suddenly appearing? That’s what I call fantasy. Assuming that 7 GW of capacity that doesn’t generate any energy most of the time is a solution is what I call a fantasy. In the real world, France took less than 16 years to decarbonize it’s electricity generation by building nuclear. Are you saying that Australia can’t do what France did 30 years ago? What I’m hearing is that you want to bet the world’s climate on technology that has never worked anywhere. That you want to keep on installing stuff that when installed in other places, as fast as it possibly could be, and for more than 20 years, after 20 years still supplies less than 30% of those places annual electrcity and mostly with wood burning. That you want to follow a path that in other places has resulted in the highest electricity prices in Europe and condemned the old, and economically weak to a life of energy poverty in which they can’t afford heating and cooling even if their lives depend on it. You’d rather bet on this fantasy, which has never worked anywhere and is continuing to fail everywhere by the only measure that matters (actual CO2 emitted per KWHr generated). You’d rather watch the world burn while you live your fantasy rather than imitate France, or Ontario, or Virginia, or Illinois, or any of the other places that have substantially decarbonized their electricity supply by building affordable, reliable, clean nuclear power. Just repeating that South Australia has greatly reduced its electricity emissions (and emission intensity) thanks to wind. It reduced from 0.55 tCO2/MWh in 2011 down to 0.37 tCO2/MWh in 2017. This is just one example of many places that have reduced their emissions due to wind and/or solar. This is a much bigger reduction than it could have achieved simply by replacing coal with gas. South Australia gets about half its electricity from wind and solar. And not just for a few short periods, but averaged over the entire year. I think you mean thanks to gas. The intermittent nature of wind means that it is backed up with gas. But does replace dirtier coal. However, the net result of replacing coal with gas backed wind is no better than the much less expensive option of just replacing coal with gas directly. And neither one is good enough. No, I don’t mean thanks to gas. It hasn’t switched to gas, as it uses a similar amount of gas to what it did in 2011. The main change was a massive increase in wind generation, which has displaced all of the coal generation, and greatly reduced emissions. Can I get you to look at the graph in the attached link, Please? You attempt to use the example of Germany and France and Nuclear Energy to say why we should have nuclear. Germany is rapidly denuclearising and our now a net energy exporter because of added RE (France being a recipient) and because other countries rely on German for power they will not close down FF energy. Having said this, the graph demonstrates they are also decarbonising their economy. These issues are the early stages of recognising the actual cost of connecting intermittent ambient energy generators to the grid. Without coupled storage they achieve capacity factors in the range 15 to 35%. It follows that for them to achieve higher market share than their capacity factor there needs to be overbuild. And the overbuild does not stop at the generation. A 250MW wind plant needs a transmission connector of 250MW eventhough its average output will be less than 80MW. When the transmission cost is added to the project, average cost of generation is a lot less attractive compared with output from dispatchable generators. The worst part economically is that the grid scale intermittents do not in any way reduce the requirement for dispatchable generation and all the existing transmission to those assets. All those assets still need to be maintained. It is good to see that the transmission cost of intermittent ambient generators is being sheeted home to the projects rather than being hidden in so-called gold plating by the network owners. Whilst the majority of the issues you raise are correct you have missed one big point. When the current “dispatchable” assets were built firstly they were built with government money i.e., everyone’s money. Secondly, those assets were also built with transmission capacity with yep you guessed it, government money i.e., everyone’s money. Does that not imply everyone’s money should be used for future build of transmission capacity? We no longer need governments to spend the money. Anyone can install their own power plant and produce power at lower cost than using grid scale ambient sources. One of the findings in the AEMO modelling for the ISP was that DER was the lowest cost path to increased proportion of ambient supply. Ultimately that avoids all the cost involved in transmission, distribution and retail. Collect energy from the ambient source at the load. It is obviously lower cost than setting up grid scale plants in remote sites and transmitting the energy thousands of kilometres. I agree the introduction of more DER helps support the network and I am part of that movement. However, it does not support the needs of everyone all the time and at those times, the grid fills the gap. For this to happen the grid has to have the necessary ability. The FF clunkers will be shutdown as the ISP describes so other grid supported sources will be required and they will not be always on the same site as the retired FF sources. The FF transmission assets will also be redundant. The grid has to adapt. No energy intensive industry can survive on ambient power sources. For example aluminium smelters need power at $30/MWh to make money in Australia. So by moving to ambient generation all these large industrial loads need their own low cost power or they close down. That leaves loads at the distribution level. All that can be met with distributed resources. Distributed energy collection and storage will always be lower cost than remote grid scale ambient generation and the associated transmission. One of the common myths offered for the value of the expansive grid is the need for geographical diversity in ambient energy generation. The is no solar input at night right across Australia and large high pressure systems can affect the entire country. Even if there was some benefit from diversity there would not be high demand for power flow across regions if there was ample storage at distribution level. The entire focus should be at load and distribution level. Adding new transmission is a waste of resources. It enables the spread of intermittency. You’re right and wrong as usual Rick: the only industrial use of ambient energy of course are heat pumps, so given you’d hardly call that energy intensive you are right. But the rest of your post is worthless, merely your own confused opinion. It is possible to run aluminium and other energy intensive industry using renewable energy, whether hydro, as many parts of the world, or solar plus storage, as Gupta is in the process of showing. No-one is building generation at $30/MWh whether Australia or elsewhere – that sort of price is only available on legacy plant fully amortised ie a short term possibility, not sustainable. Even large hydro is coming in a $40-50. ME plants are running at no fuel costs where using refinery gas and $30 would represent capital and O&M – again not sustainable. But all a bit academic with current alumina prices of $600-700/t so no-one is making money with aluminium at $2k/t. And while there is obvious scope for DER to substantially reduce home use, unless we abandon current high rise building design, a grid supply will continue to be required. The aluminium smelters were all attracted to invest in Australia on the basis of marginal cost base load power. That commodity is gradually being eroded by the intermittency disease that has infected the grid. It kills base demand and therefore base load generation. Hence will gradually kill off all marginal cost base loads; read aluminium smelters. Remote grid scale wind and solar supplying a grid are simply a waste of resources. Any expansion of the existing grid is a waste of resources. The investment in intermittent ambient generation needs to be at user and distribution level. So what you are saying is that some industries were attracted by subsidies such that they paid SRMC rather than LRMC for power. There’s nothing stopping those subsidies being offered again, explicitly, but meanwhile some energy intensive industries are investing in low cost VRE which will reach your benchmark of $30 in the near future. But the challenge for copper and aluminium is the high oil price, killing them in mining and concentrating (copper) and alumina production. Nickel production mates well with hydro so depending on storage, addition of solar or wind would extend the available low cost energy. I agree re car parks and supermarket roofs – no brainer – and solar at local and distribution level, including a level of storage. Ambient energy will have a role thru heat pumps if the refrigerant is right, but can’t see a role at all for ambient generation: Carnot efficiencies kill it. The marginal cost is not a subsidy – it is the MARGINAL cost that was fully recovered from the smelters. It was a win for the power stations to give them a base demand. It meant they could stay hot through the night and get paid for it. It was one of the great success stories for Australia value adding to its bauxite mining. Magazines such as RenewEconomy has not been helpful in the debate when naysayers in the past have provided many comments about this and similar issues, and were banned for saying so. It didn’t meet the narrative, which is a perennial problem with Green focused eyes wearing rosy glasses. I notice most of the comments run off quickly to find solutions, yet none talk about bringing the issues to full light that many knew way back before 2010. That is, renewable/greenie focussed arguments were deliberately simplified to 10 year old discussions, at which level politicians could be persuaded to spend money. This article, while seemingly being more balanced and informative than usual, is spreading the problem around, while the obvious underlying problem has been that ill-informed general knowledge has encouraged entrepreneurs without necessary skills to think this business was a gold paved road, pushed by populist agendas with simplistic messages..
Not promoting a return back, but imagine had there been no CO2 targets and coal and gas had just done what they always did…would we have the high prices now? The simple answer is no, because we now have massive generation duplication, solar and wind doing what existing fossil did, and would be doing, and both trying to share the same grid, one of which expects a free ride on all the technical demands that provide stable supply. The result is that some companies game the market to get a buck, needed because if they don’t they will close down, (which is actually beneficial for them because it leads to supply constraint/higher prices, or worst the dividend stream they have come to love drys up, (looking at you Queensland Government) . JH if you have an interest in mature debate, why open with finger pointing instead of substantive argument. Numerous very “non-Green” organisations have done objective analysis of the price structures, and their analysis refutes your contentions. High prices result from high network charges and high retail margins, the latter pointing to market competition issues. Furthermore, high wholesale energy prices (even tho’ not the majority of cost increases, are enabled by lack of competition and a market design focused on energy costs, when marginal costs of solar and wind are virtually zero: the result is simple economics! The fall in VRE costs has happened across the globe as the result of scale of production and ongoing innovation, not government policy, and the aging of thermal plant is the inevitable march of time: lower prices in the market would have brought the retirements forward not back, and opening the gas market to export with no domestic reserve was a private sector investment decision in the face of government lack of policy. So just where is your substantive input into the debate?